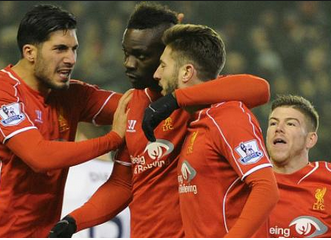 Liverpool vs Tottenham match ended with 3-2 scoreline in English Premier League 2015. Mario Balotelli scored his first Premier League goal of the season with seven minutes remaining to give Liverpool a 3-2 win over Tottenham at Anfield.Balotelli, after such a frustrating start to his Liverpool career, could be forgiven for skittering all round Anfield to celebrate such an important goal, but opts to wander off calmly, like a man popping out to the shops for 20 Bensons and a pint of milk. Magnificent. Full Time Score : Liverpool 3-2 Tottenham.